Students in first through eighth grade at Pocantico Hills Central School entertained parents and guests with winter concerts in December. 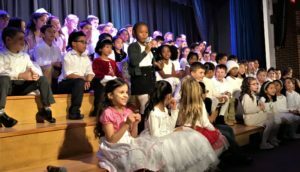 On December 12, first- and second-graders wowed the audience with their performance of the songs and speaking parts in the mini-musical “Flakes!” by John Jacobson and John Higgins. Children in grades 3 and 4 performed six songs for their Holiday Jazz concert the same night from “Let it Snow! Let it Snow! Let it Snow!” to “Zemer Atik,” an Israeli folk dance, to a dance of “Gatatumba,” a traditional Adalusian carol. 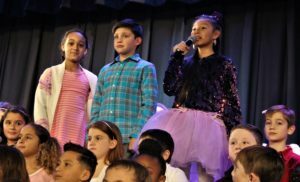 The fifth- and sixth-grade bands and chorus played and sang music ranging from “A Charlie Brown Christmas” to the “Nutcracker” to the traditional Hebrew folk song “Do Di Li” on December 19. A student dressed as a Tyrannosaurus rex helped band director Michael Murray conduct the “Theme from Jurassic Park” for the seventh- and eighth-grade band concert. The chorus’ program included “Everybody Rejoice” by Luther Vandross. Murray and choral director Sheila DePaola directed the shows. PH-2: Students perform speaking parts during the grade 3 and 4 Holiday Jazz concert in December.